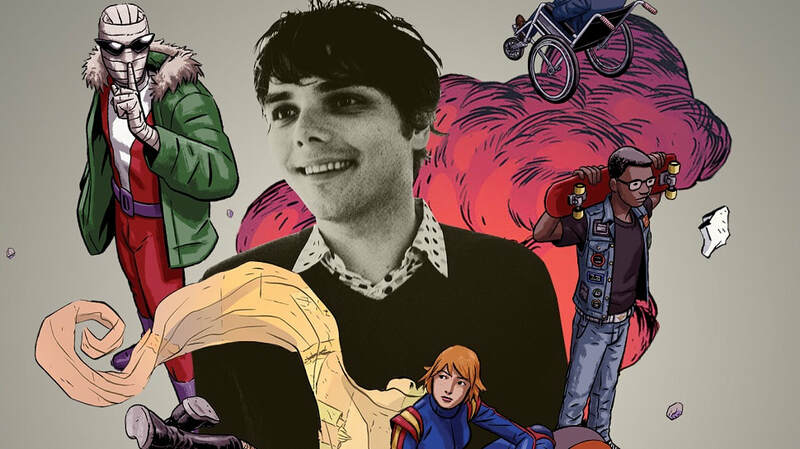 I have a weird relationship with Gerard Way when it comes to comics. The man can pen a tune but penning a comic is a completely different ball game. If you listen to Chris's Comics podcast, you'll have heard me wonder in curiosity at 'The Umbrella Academy' run, and despair at 'The True Lives of the Fabulous Killjoys'. More often than not, Gerard runs away with his ideas and I feel he needs reigning in. He can create an entire universe in his head but then struggles to put it all down on paper. I admire his creativity, yet I get irritated at his references, his characters and the dialogue that is brought up regularly throughout the pages of his comics, as it normally is just random and sporadic, and has nothing to do with the story. Going off pisté is fine but there is an art to it. SAGA does it phenomenally well. Mr Way, not so. So when I was told that Gerard was taking over an already established title, I became inquisitive. I myself have never read ANY Doom Patrol before. For those that don't know, it's been around since 1963 and the line-up has changed numerous times, as has the publisher. I realised that this would give Gerard a LOT to work with, on the other hand though, he couldn't run away with his imagination too much as a fair amount of this comics roots and characters have already been established. Here were the reigns!! Perfect. But did they work? This comic is mental. I laugh now thinking that I considered Gerard would allow himself to be pegged into a hole. The very concept of some of these characters is unimaginable. To talk about them would spoil some plot points of the comic but at one point we do have a sentient, space travelling brick narrating the story, I don't know if that helps you get an idea of what we're dealing with. This is an origin story for some of these characters, and with 10 characters that's a lot of back and forth between arcs and journeys. I'm not going to lie, it was a confusing read. Gerard did his thing were he bounced his ideas from page to page like a 7 year old on cocaine. Unlike previous reads though...I didn't mind. I was genuinely interested in what was going on. Yes, I didn't really understand it but the cast carried me from panel to panel by all just being interesting. The more I think about it, the more I have to admit I don't really know what happened. It was a really trippy, beautiful journey from front to back in this book and I was decidedly happy the whole way through. But how come? What makes this different from my terrible experience with 'True Lives...'? A book that I really had no idea what was going on at all. However, Gerard is still stuck in some of his old habits. One page is dedicated to showing you someone feeding a cat, the cat mutating and gaining a lot of physical human attributes. There is nothing prior to this that suggests why this scene needed to be in it and nothing refers back to this page again. You could rip that page out the comic and you'd be none the wiser. My favourite thing in this is the amazing artwork. With such an inventive world and concept, comes inventive imagery. The stunning colour work on each leaf made my eyes gush. Lying somewhere between Doctor Strange and Preacher on the weird visual representations, the story is brilliantly upheld by Nick and Tamra. And another thing, the panelling! I am not normally one to comment on this, but I loved the layout on each page. It flowed really well and it possibly contains one of my favourite uses of a panel ever, where 2 of our heroes are on a train and the panel betwixt them acts as the passenger pole grip, with one of the characters actually wrapping their hand around it. Subtle little things like that are my jam. They show passion and careful thinking. The humour and dialogue is a lot stronger than any of his previous work. Even more so than 'Umbrella Academy'. I know this is an odd thing to say after saying I found the comic hard to follow but I totally understood the characters. I got their fears, their loves and most importantly, their personalities. I think the whole book hangs on how much you like these guys and Gerard makes them all loveable in their own way, even though he's juggling so many. Yes, they aren't as thickened out as much as other heroes but that's what future issues can do. This comics biggest problem is probably still Gerard to some degree. He's much more on point than he was writing 'True Lives...' but he is still not quite up to the standards he set himself with 'Umbrella Academy'. The story was just so mind-boggling and jumping from place to place I just found it hard to keep up with it. Mind you, I am going to re-read this to see if I can wrap my head any easier around the crazy story...and you know what? I'm looking forward to it. This is not a bad book by any means of the word. It's crazy, weird in tone and brutally honest about it. It holds its strange head high and tells you to get on this flying ambulance and deal with it. And I am totally cool with that.